The University of Sydney's Carslaw Building is situated on the south-east side of the central campus, near the northern end of the footbridge crossing City Road from the Wentworth Building. Other nearby buildings include the Eastern Avenue auditorium and lecture-theatre complex, the Madsen Building (housing the School of GeoSciences) and the School of Chemistry Building. 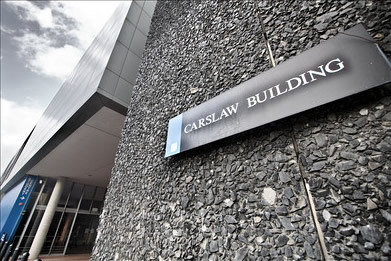 The Carslaw Building dates from the early 1960s, and is named after the eminent mathematician Horatio Scott Carslaw (1870-1954), once Professor of Mathematics in the University. An addition to the building known as the Carslaw Extension was opened in late 1993. See the main campus and local maps. Visitors may park on campus for a fee of about $25.00 per day. However, parking spaces are sometimes hard to find. Bus services run along City Road (adjacent to Carslaw) and Parramatta Road (on the other side of the campus). There is a train service from Redfern Station which is less than 15 minutes walk away in the daytime; free security buses run between Fisher Library and Redfern Station in the evening. The internal university postcode for the Carslaw Building is F07.